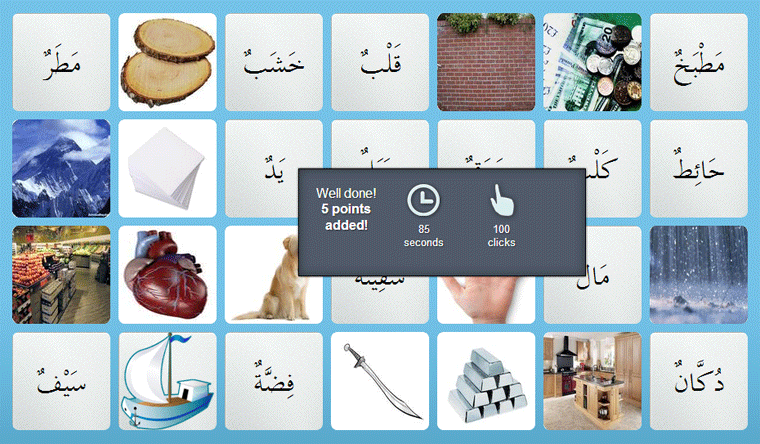 Boost Your Brainpower and Arabic Vocabulary: Play the Memory Match Game! We just incorporated a new app into the Learnarabic.Com platform which improves your memory in two ways. Firstly By stretching your short term memory as you play, and secondly, by adding to your long term memory of Arabic words. This is great fun for children and adults alike and it is a way to make sure that you are increasing your vocabulary list as you proceed. A key to being proficient in Arabic is that you must increase your vocabulary base as you go along and not just get bogged down in other areas, such as learning grammar. These quizzes will be found in every place where you are introduced to new vocabulary. For the absolute beginners base of 100 words, the relevant quizzes can be found Course Library => From Letters to Words! => Your First 100 Arabic Words!. So Login right now and start exercising those neurons. Related search terms: arabic vocabulary, arabic words, arabic nouns, الأسماء العربية.